AlkaVision GreenShield™ Greens is one of the best green drink products on the market. AlkaVision GreenShield™ Greens is a blend of 100% organic ingredients grown around the world, dehydrated at low temperatures and are preserved in their original state. GreenShield is the only product on the market with clay in it. Drinking a chlorophyll rich beverage has been found to benefit your entire body including blood. AlkaVision GreenShield™ Greens is a specially formulated nutritional supplement which provides most nutritional substances largely missing from our modern diet. The ingredients are obtained from across the world, organically grown, and harvested at their peak and never heat treated. All herbs are highest quality, and standardized. AlkaVision GreenShield is the only green drink product on the market with clay in it. AlkaVision GreenShield™ Greens is a perfect blend of powerful whole food vegetables, immune boosting support herbs, and healing clay. Our powder mixes so easily with water; you'll wonder how essential green nutrition could taste this good. AlkaVision GreenShield™ Greens Is A Safe Way To Lose Weight! While weight issue is an acid issue and getting rid of acid means that those pounds have no chance of survival. GreenShield Greens is the first and the best line of defense against acid and fat. Expect to lose up to 3-6 pounds a week. GreenShield also suppresses your appetite so you eat less - naturally losing weight. * Increase energy - relieves fatigue and stress without the use of stimulants. 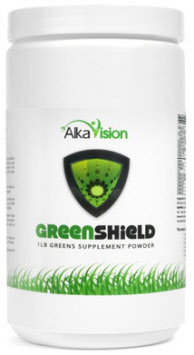 AlkaVision GreenShield™ Greens is nutrient rich and offers a potent source of vitamins, minerals, enzymes, cell salts, trace minerals essential amino acids and antioxidants. One serving of GreenShield is equivalent to eating 5 cups of organic vegetables. Some individuals may prefer to begin with 1/2 to 1 tsp of AlkaVision GreenShield™ Greens daily for a week, and gradually increase this dosage to 2-3 level tsp. This will prevent, or slow down possible symptoms associated with detoxification of the system. Each individual will experience different reactions, as their history of health or illness is a very personal thing. Lasting health is not something which is established overnight, and any pill which promises this only removes the symptom, and exacerbates the problem somewhere else. Sickness develops over a long period and is only experienced when the body becomes overwhelmed by the toxins in it. AlkaVision GreenShield™ Greens is a powerful green drink that can help detoxify your colon and your blood. This drink keeps your colon and your whole body working better and longer. AlkaVision GreenShield is rich in chlorophyll which has many benefits. It is capable of neutralizing substances that cause cell mutations and strengthens the cell walls of the small intestine and colon. It has an exceptional deodorizing effect on your body and on the stools you have during a bowel movement. According to statistics, nearly 90% of us don't get enough servings of vegetables everyday. AlkaVision GreenShield™ Greens allows you to get the best nutrition any time of day, everyday. For those that haven’t acquired the taste for cereal grasses, we’re confident your taste buds will love our AlkaVision GreenShield™ Greens! AlkaVision GreenShield™ Greens contains nutritious whole foods! Whole foods, like our cereal grasses, contain potentially thousands of unidentified nutrients that can’t be isolated and put into a synthetic multi-vitamin. Mother Nature has had thousands of years to perfect the ideal combination of these nutrients that work synergistically in harmony with one another. Our bodies recognize these whole food compounds and can selectively absorb exactly what it needs and what it doesn’t need. AlkaVision GreenShield™ Greens helps your body get the best natural whole food nutrition it needs to be as healthy as possible. AlkaVision GreenShield™ Greens is the only green food blend on the market that has clay in it. Why do we use clay? Montmorillonite clay is a non-swelling green healing clay known to have potent healing properties. Clay molecules carry negatively charged ions. Pollutants carry positively charged ions. Clay particles do two things that work in our favor. Firstly, they attract the positively charged toxins which is called adsorbing. Secondly, they absorb these toxins literally locking them away and protecting us from them. The structure of clay is like layers of playing cards with space between them. These layers swell as they absorb pollutants and toxic substances. The greater the surface area the greater the power to pick up positively charged particles of toxins and heavy metals. GreenShield™ Greens does not contain any: Spirulina, Algae or Roots, Corn or Mushrooms, Fruits or sugar, Yeast, Dairy or Eggs, No preservatives, No artificial color or flavor. Q: What are the ingredients in AlkaVision GreenShield™ Greens? A: Ingredients: 100% Organic Barley Grass, Organic Lemon Grass, Organic Shave Grass, Organic Wheat Grass, Organic Dog Grass, Organic Spinach, Organic Peppermint Leaf, Organic Spearmint Leaf, Organic Lemon Powder, Montmorillonite Clay, Organic Aloe, Organic Dandelion, Organic Parsley, Organic Wintergreens. Q: Why should I drink a Green drink? A: AlkaVision GreenShield™ Greens is a specially formulated nutritional supplement which provides most nutritional substances largely missing from our modern diet. The ingredients are obtained from across the world, organically grown, and harvested at their peak and never heat treated. All herbs are highest quality, and standardized. AlkaVision GreenShield™ Greens is the only green drink product on the market that contains clay in it. A: We suggest you use it as much as you can, put AlkaVision GreenShield™ Greens in every water you drink. We also recommend that you use Plasma pH Drops in the water. We also recommend that you drink at least 1 liter for every 40 lbs. of weight. Q: Who cannot use it? A: We believe that drinking a green type of drink can be beneficial to any one. Please consult your doctor or health professional before using any supplements. I must say I was pleasantly surprised after my first sip of GREENSHIELD, the taste is simply terrific, as is lacking with most green drinks out there,....I felt a "buzz" almost immediately after drinking it, and so I was quite happy to have sips throughout the whole day. The taste is quite mild, and pleasant on the palate, and you really feel it the very first time you drink it. I think it's the "Real McCoy", and the price as well is very affordable. I'm looking forward to AlkaVision's upcoming new products, as I'm already convinced and a believer in this line of products. I have been using the pH drops and green shield pretty faithfully. The GreenShieldhas a wonderful taste! I promise to keep ordering....!!! I love the product... I drink GreenShield instead of my coffee every morning!!! I do still need to drink more water, but I do only drink water so I have come along ways... have lost about 6 lb to keep off and am doing great... still need to work on a more alkaline diet... but baby steps are working!!! Thanks to God for putting you in my path!!! I ordered my first bottle of GreenShield over a week ago and have been very satisfied with it. Both my husband and I have tried at least 3 other green drinks, and none of them measure up to GreenShield! Most green drinks don't taste good, but yours does. That's quite a surprise! Other green drinks try to include every imaginable supplement. Unfortunately, many of those supplements are acidic and defeat the purpose of the green drink. I can assure you that my husband and I will be loyal customers and will continue to use your product. In fact, our first order was a test to determine if we liked GreenShield. Our next order will be for 10 bottles. We don't ever want to run out of it! Vital nutrition in a fantastic fibre source. 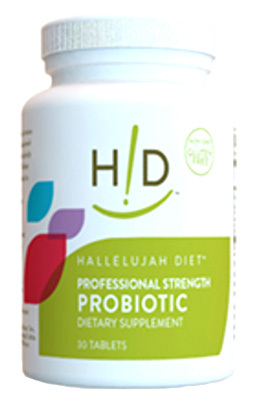 Formulated specifically for long-term use, providing an easy transition for those who have been using Hallelujah Acres Fibre Cleanse. - Provides Omega-3 essential fats, and many other nutrients to help achieve and maintain optimal bowel function. - B12 aids in healthy cell formation. - Vitamin D assists the body in the absorption of important minerals like calcium. - A source of selenium, a mineral with powerful anti-viral and disease-fighting properties. Seleno-yeast is not candida yeast and should not encourage the growth of candida. 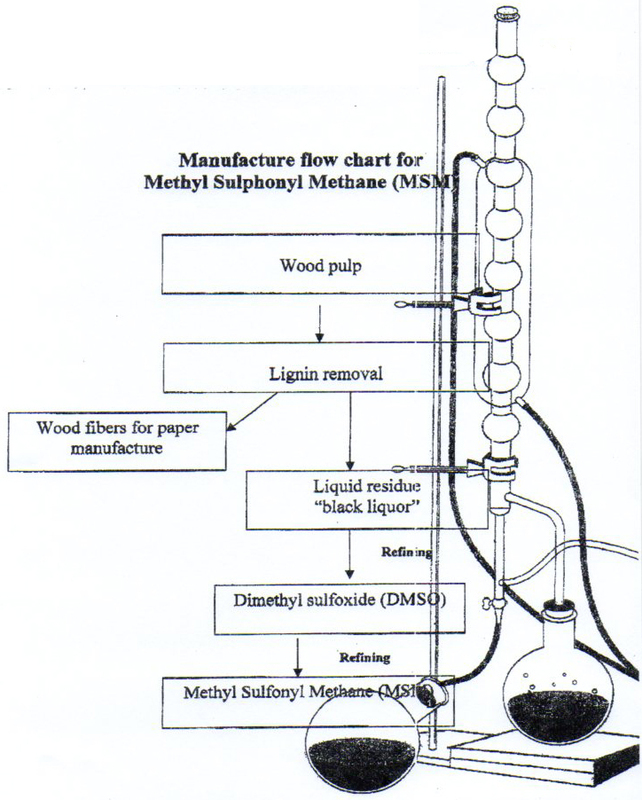 Seleno-yeast is a Saccharomyces cerevisiae grown on enriched cane and beet molasses. There are 120 mg of seleno-yeast per 30 g serving. Those with true allergic reactions to yeast should consider this before using this product. - MenaQ7TM provides vitamin K2 (menaquinone), extracted and concentrated from natto without solvents. Vitamin K2 prevents arterial calcification and promotes strong bones by improving cross-linking of osteocalcin, a protein found in bones. The amount here has been clinically shown not to interfere with blood anti-coagulant medication. B-Flax-D is a 100% vegetarian product. Does Not Contain: Contains no artificial colours or preservatives. 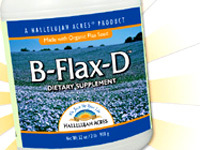 Suggested Use: B-Flax-D is best taken on an empty stomach, 30 minutes or more before a meal, or 2-3 hours after. Adult serving: mix 1 to 2 Tablespoons of B-Flax-D with 6-8 ounces of water or juice. Gradually work up to a full serving - 1/4 cup of B-Flax-D. Contradictions: Please note that the source for selenium in B-Flax-D is seleno-yeast, a Saccharomyces cerevisiae grown on enriched cane and beet molasses. Seleno-yeast is not candida yeast and should not encourage the growth of candida. There are 120 mg of seleno-yeast per 30 g serving. Those with true allergic reactions to yeast should consider this before using this product. Good colon health is necessary for good overall health. Achieving and maintaining good colon health, as demonstrated by proper bowel function, can be greatly enhanced by adding a fiber product such as B-Flax-D to the diet. Insoluble fibre from flax holds water and increases bulk, which helps to maintain optimal bowel function. Soluble fibre helps absorb cholesterol, which keeps it from being reabsorbed from the intestine ' an important point to know for those who are concerned with their cholesterol levels. It also keeps beneficial bacteria in balance in the colon, and the colon in good working order. Additionally, soluble fibre slows down the absorption of glucose from food, thus reducing the glycemic response to carbohydrate foods ' something that people with diabetes should consider. Flax contains naturally occurring calcium, chromium, magnesium, phosphorus, and zinc in beneficial amounts. Approximately 57% of the fat in the flaxseeds in B-Flax-D are ALA (Alpha-linolenic acid); research has shown that ALA helps stabilize the electric patterns in the heart, which can prevent arrhythmias. Vitamin K plays an important role in helping to build strong bones, prevent osteoporosis and maintain a healthy heart and cardiovascular system. Natural Vitamin K2 is the most effective, bioavailable and bioactive form of Vitamin K. MenaQ7TM, the type of K2 used in B-Flax-D, is the only clinically proven Natural Vitamin K2. Calcium is needed to build strong bones. But without Vitamin K, our bodies cannot use calcium! Clinical studies have shown that Vitamin K is vital in supporting bone health because it activates a special protein (osteocalcin) that is necessary to use calcium to build healthy bone tissue. Calcium is a vital nutrient used by every cell in our bodies. New research has shown that Natural Vitamin K2 is essential for our arteries, veins and heart! Natural Vitamin K2 is the effective form of K because it activates a special protein (matrix GLA) that is necessary for the vascular tissues to make use of and then remove excess calcium. Regular use of B-Flax-D will ensure that a person gets a sufficient amount of vitamin B12, an important component of total health. B12 is important for healthy cell production, such as red blood cells, which contain the hemoglobin responsible for transporting oxygen throughout the body, whereas a deficiency in B12 has been linked to anemia. Vitamin B12 also aids in cell formation and cellular longevity. A single serving of B-Flax-D contains 990Âµg of the methylcobalamin form of B12, which has been found to be cancer-protective in animal studies. It has also been linked to the production of acetylcholine, a neurotransmitter that assists memory and learning. Sunshine is the best source of vitamin D, a pro-hormone that is essential for strong bones and a healthy body. However, getting adequate levels of UV light from sunshine to produce the proper level of vitamin D in the body is not always possible, making supplementation with a product like B-Flax-D a wise choice. The main action of vitamin D is to regulate the absorption of calcium in the small intestine. Optimal levels of Vitamin D (78-100nmol/L) can increase calcium absorption by 65% (compared to a low 'normal' level). BarleyMax® is a one-of-a-kind super food that helps build strong, healthy new cells in your body. 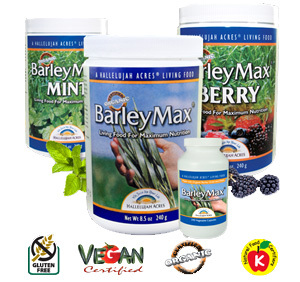 BarleyMax® is a certified organic whole-food concentrate made from the juice of young barley grass and alfalfa providing one of the widest spectrums of naturally occurring nutrients available in a single source. It is kept enzymatically alive with low-temperature processing that does not damage heat sensitive nutrients and keeps the enzymes alive. 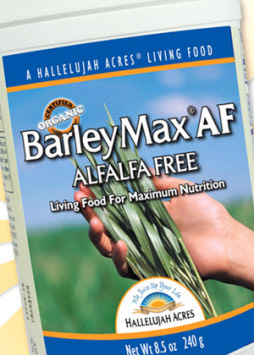 BarleyMax® contains no additives, just barley and alfalfa juices & natural berry flavouring! No fibre, not a ground leaf product. High levels of enzyme activity; a wide variety of vitamins and minerals; rich source of antioxidants; certified organic; tastes great and mixes well. Most grass powders available in the marketplace are leaf powders. The difference between leaf powders & juice powders is vast - like comparing cooked white rice with raw brown rice sprouts! 3. The dried leaves are ground to a powder in a steel mill - the friction involves 'cooks' the powder. The manufacturer faces a dilemma - if the grass is ground finely to make it more digestible because cellulose is mostly indigestible, this increase the friction & following on from that the heat & there will be more nutrient destruction. Conversely, if the grass is not ground as finely there will be less friction therefore less heat & less nutrient destruction but the powder will be less digestible. 2. The leaves are juiced at low temperature - this strips away the indigestible cellulose & concentrates the nutrients 3 times. 3. The juice is freezedried. 3. The freezedried juice is rolled at low temperature to make it into powder. The juice powder is up to 3 times more concentrated & also 3 times more bioavailable making it 9 times stronger! BarleyMax® is certified organic, grown on 900 acres of mineral-rich volcanic lakebed soil at an elevation of 5,000 feet without the use of any pesticides or chemical fertilizers. This promotes slower growth and incredible nutritional content. The grass juice from this land has by far the highest solids content (BRIX) of any similar products, indicating the mineral-richness of the soil. These crops are fertilized naturally with alfalfa chop and barley pulp (left over from juicing), and other organically-approved soil amendments and irrigated with deep source groundwater for maximum nutrient uptake. We also practice crop rotation, allowing the soil to lie fallow every couple of years to rest and recharge. BarleyMax® is a 100% natural dried juice powder, with over 99% of the fibre removed. The bright green colour of BarleyMax® is the natural chlorophyll with no artificial colours or flavourings added. Healthy bacteria: Some true juice products are sanitized in a way that kills beneficial bacteria. Our cleaning process retains naturally occurring bacteria your body needs. BarleyMax® is made from young barley leaves and alfalfa leaves harvested at their peak nutrient levels (10-14 inches high), and juiced in the field. Many other brands are grown to 1m high. BarleyMax® contains 80% organically grown barley juice concentrate and 20% enzyme-rich and nutrient-dense alfalfa concentrate. Alfalfa plants have roots that reach deep into the earth, drawing out precious trace minerals that are not found in other grasses. What's so special about barley & alfalfa? Through a new drying process, we're able to produce a finer, yet more compact powder—while still keeping the high nutritional content you need, with even higher levels of protein, Vitamins A and E, Folate, Zinc, Manganese and Potassium! The result is a denser powder, so you can use less per serving—only 1 level teaspoon—to get the full nutritional value! BarleyMax® is gently dehydrated below 106°F using a patented drying process to preserve the delicate life essences (enzymes) contained within the living plant and lock in nutritional potency and retain the highest enzyme activity of any juice powder you can buy. Unlike some other barley grass products, BarleyMax® contains no Maltodextrin, which is a plus for people who are sensitive to this preservative or who suffer from conditions that affect blood sugar. Our extensive studies show the superior enzymatic activity in BarleyMax does not diminish for lack of Maltodextrin. BarleyMax provides a superior blend of all known vitamins including A, E, and folate, protein, BarleyMax contains 23 minerals,minerals including, zinc, manganese, calcium, magnesium, iron, phosphorus and potassium, 18 amino acids, chlorophyll, flavonoids, many trace elements, antioxidants, plus a high level of usuable enzymatic activity that is necessary for building new, strong, healthy and vital cells in your body. BarleyMax doesn't rely on lab-created chemicals for it's nutritional values. Natural vitamins are always found in food as living complexes making them easier for your cells to absorb. In balanced proportions, these give more cofactors for higher enzyme activity. Our research also indicates higher vitamin content in BarleyMax® than similar products. Antioxidants help the body defend itself from free radicals, which play a large role in disease and aging. In a measure of total antioxidant capacity, BarleyMax® is the leading barley juice of all the products we have tested. BarleyMax® has one of the most alkaline pH factors available in a food and contains large amounts of natural chlorophyll (the blood of the plant). 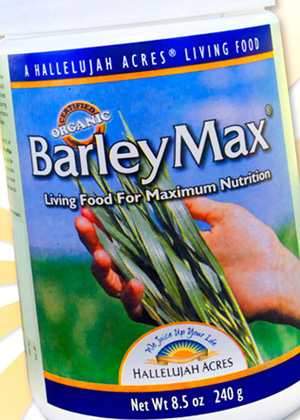 Even people with a sensitivity to the gluten in wheat and other grains can drink BarleyMax®. Chlorophyll has been shown to accelerate the healing of wounds with no toxic side effects, protect against chemicals and radiation, and to promote intestinal regularity. One heaping teaspoon (2g) of BarleyMax® contains only 6 calories, yet it contains the nutrition of a large handful of barley grass and alfalfa. Because of its richness in nutrients, drinking BarleyMax® and freshly extracted vegetable juices will aid the body in detoxification and in the activation of its self-healing. * BarleyMax® is simple and convenient! * You simply mix it in water or your favourite juice! * Since it is in juice form, BarleyMax® will be assimilated much more quickly into your blood stream than other foods or supplements. BarleyMax® can actually pass directly from your mouth into your bloodstream without going through the rest of your digestive system. * BarleyMax® is the easy way to fill in the gaps in your diet. * BarleyMax® is significant nutrition! * One of the widest varieties of "naturally occurring" nutrients available in a single source. * You never have to wonder again if you are including enough green vegetables in your diet. * Current research points increasingly to significant health benefits found in green vegetables. * With BarleyMax®, you never have to wonder about quality or purity. Every harvest is tested for nutrient levels and purity, with only the highest standards accepted. 1. The average serving of BarleyMax® is two heaping teaspoons (4g) each day. However, many people use more or less depending on their own assessment of nutritional needs. Many begin with ½ teaspoon each day and increase gradually every four or five days. Young children usually begin with ¼ teaspoon each day and gradually increase up to 1 teaspoon daily. Teenagers often increase up to 2 tablespoons each day. Athletes and people dealing with large amounts of stress or health challenges often take larger amounts: sometimes as many as 6 tablespoons (24g) daily. When taking larger amounts, it is better to take BarleyMax® 3 times each day instead of all at once. 2. The best results will come from placing BarleyMax® dry under the tongue. Much of it will then be absorbed through the mucous membrane directly into the bloodstream. However, most people enjoy their BarleyMax® in purified water or their favourite juice. Many folks find a heaping teaspoon of BarleyMax® mixed with four to six ounces of apple or carrot juice a tasty combination. It is NOT recommended to take BarleyMax® in any of the following: cranberry or prune juice, any carbonated drinks, or any hot drinks. BarleyMax® delivers the maximum benefits when taken on an empty stomach, which means 30 minutes before or two hours after a meal. However, there will still be some benefit no matter when you take BarleyMax®. Some people enjoy putting BarleyMax® in vegetable dips, or on top of applesauce, etc. 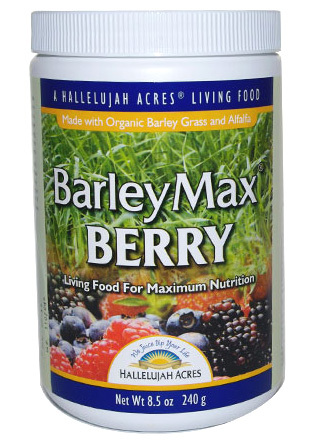 It is important to drink BarleyMax® immediately after mixing in a liquid since this activates the nutrients and they will begin to deteriorate within 30 minutes. BarleyMax® will keep some people awake if taken too late in the day. For others, it is the perfect nightcap for a restful sleep. Do some experimenting to see exactly how it works for you. 3. BarleyMax® has a 3 to 5 year shelf life under normal conditions. It should be stored in a dark, dry place at normal room temperature. Can I take my BarleyMax® while on a medication? As long as your doctor has not forbidden you to eat salads or green vegetables, you can use BarleyMax®. It will not interfere with your medication. For those who have digestive problems which normally make salads bothersome because of the roughage, BarleyMax® is the ideal substitute since the fibre has been removed. Can I stop taking vitamins and minerals when I take BarleyMax®? Although BarleyMax® provides a very wide spectrum of naturally occurring nutrients, some people will want to continue to take supplements according to their own personal preference or needs. Because BarleyMax® is a natural whole food its nutritional value is not measured by governmental "recommended daily allowances" which are used to measure synthetic supplements. No! Barley juice powder has been used by over 2 million people in Japan for over 20 years and has been used in the United States and Canada since 1982. It is not toxic and is 100% organically grown. However, it is important to use common sense when starting on BarleyMax® and begin with small amounts, increasing gradually. Because it is a whole food concentrate, the body will need some time to adjust to its nutritional contributions. Is there anyone who should not use BarleyMax®? If your doctor has forbidden you to eat salads or green vegetables, you should consult on your use of BarleyMax. Remember, BarleyMax does not contain the fiber or grain components which can irritate certain conditions. How is BarleyMax® different from Green Magma or other green powders sold in health food stores? BarleyMax is significantly different from the other green powders being sold today. It is one of the few true "juice" powders and it is processed by a low-temperature method that is state-of- the-art. BarleyMax’s concentrated purity (no fibre or fillers) and unique blend of barley and alfalfa make it the best bargain by far. BarleyMax® Original contains 80% organically grown barley juice concentrate and 20% enzyme-rich and nutrient-dense alfalfa concentrate. Enjoy the taste of good nutrition! All-natural flavours from the berry patch create a rich, fruity taste with all the nutrition of original BarleyMax®. Pure powdered juice from young, organically grown barley leaves. Epsom salt, named for a bitter saline spring at Epsom in Surrey, England, is not actually salt but a naturally occurring pure mineral compound of magnesium and sulphate. Long known as a natural remedy for a number of ailments, Epsom salt has numerous health benefits as well as many beauty, household, and gardening-related uses. Studies have shown that magnesium and sulphate are both readily absorbed through the skin, making Epsom salt baths an easy and ideal way to enjoy the associated health benefits1. Magnesium plays a number of roles in the body including regulating the activity of over 325 enzymes, reducing inflammation, helping muscle and nerve function, and helping to prevent artery hardening. Sulphates help improve the absorption of nutrients, flush toxins, and help ease migraine headaches. What are the health benefits of using Epsom Salts? The wonders of Epsom Salt have been well known for hundreds of years and, unlike other salts, has beneficial properties that can soothe the body, mind, and soul. Some of the countless health benefits include relaxing the nervous system, curing skin problems, soothing back pain and aching limbs, easing muscle strain, healing cuts, treating colds and congestion, and drawing toxins from the body. One of the simplest ways to ease stress and stress-related problems is to soak in a tub full of hot water with a few cups of Epsom Salt. An Epsom salt bath is known to ease pain and relieve inflammation, making it beneficial in the treatment of sore muscles, bronchial asthma, and migraine headaches. In addition, it has been known to heal cuts and reduce soreness from childbirth. Mix a thick paste of Epsom salt with hot water and apply to get soothing comfort. Try soaking your aching, tired (and smelly) feet in a tub of water with half a cup of our Epsom Salt. Epsom salt softens skin and will even neutralize foot odour. Proper magnesium and sulphate levels increase the effectiveness of insulin in the body, and can help to lower the risk or severity of diabetes. Numerous studies have revealed that Epsom salt can be used to treat constipation. Taken internally, Epsom salt acts as a detoxifying agent for colon cleansing. The salt acts like a laxative by increasing water in the intestines and can bring about temporary relief from constipation. However, it is strictly warned that Epsom salts should not be used to relieve constipation without the consultation of a physician. The sulphates in Epsom salt help flush toxins and heavy metals from the cells, easing muscle pain and helping the body to eliminate harmful substances. Your skin is a highly porous membrane and adding the right minerals to your bathwater triggers a process called reverse osmosis, which actually pulls salt out of your body, and harmful toxins along with it. For a detoxifying bath, at least once weekly add two cups of our Ultra Epsom Salt to the water in a bathtub and soak for 10 minutes. Soak feet in an Epsom salt bath to help relieve the symptoms of athlete’s foot. Soak affected skin area in an Epsom salt bath to draw out the splinter. Soak your affected toes in hot water mixed with a handful of Epsom salt three times a day. Add 2 cups of Epsom salt to a warm bath and soak to reduce the pain and swelling of sprains and bruises. Ease the discomfort of gout and reduce inflammation by adding 2–3 teaspoons of Epsom salts into a basin and immersing the affected foot/joint. The water should be as hot as it is comfortable. Soak for about 30 minutes. In the shower or bath, mix a handful of Epsom salt with a tablespoon of bath or olive oil and rub all over your wet skin to exfoliate and soften. Rinse thoroughly. To clean your face and exfoliate skin at the same time, mix a half-teaspoon of Epsom salt with your regular cleansing cream. Gently massage into skin and rinse with cold water. Add a teaspoon of Epsom salt and 3 drops of iodine into a half cup of boiling water. Apply this mixture to the blackheads with a cotton ball. Mix a half cup of Epsom salt in warm water and soak your feet for 10 minutes to remove bad odor, sooth achy feet, and soften rough skin. Combine 1 gallon of water, 1 cup of lemon juice, and 1 cup Epsom salt. Cover the mixture and let set for 24 hours. The next day, pour the mixture into your dry hair and leave on for 20 minutes before shampooing as normal. Combine equal parts deep conditioner and Epsom salt and warm in a pan. Work the warm mixture through your hair and leave on for 20 minutes. Rinse thoroughly. Mix equal parts Epsom salt and liquid dish detergent and use as a scrub on bathroom tile. Sprinkle Epsom salt on or near interior entry points to prevent slugs. As a hand wash: Mix Epsom salt with olive oil and keep by the sink for an effective hand wash. Fill the machine tub with hot water, add Epsom salt, and run an agitate/soak/agitate cycle to dissolve detergent build-up (please consult your machine’s instruction manual for specific instructions). Most plants need nutrients like magnesium and sulphur to stay in good health, and Epsom salt makes the primary nutrients in most plant foods (nitrogen, phosphorus, potassium) more effective. Sprinkle Epsom salt once weekly to help nourish your houseplants, flowers, and vegetables. Magnesium sulphate crystals, when added to the soil, provide vital nutrients that help prevent yellowing leaves and the loss of green color (magnesium is an essential element in the chlorophyll molecule) in plants. Add 2 tablespoons of Epsom salt to a gallon of water and sprinkle on your lawn to keep the grass healthy and green. Use Epsom salt on your lawn and in your garden to safely and naturally get rid of plant pests. Our Epsome Salt is the Magnesium Sulphate Pentahydrate powder which is more concentrated at 57% Epsom Salt and also dissolves more easily than the common Magnesium Sulphate Heptahydrate crystals which are only 49% Epsom Salt. Most food enzymes are destroyed through cooking and processing food resulting in the possibility of the body’s digestive process to become over-stressed. 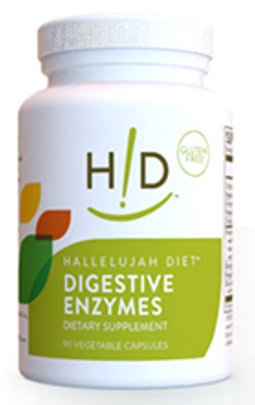 Digestive Enzyme assures that the maximum level of nutrient absorption is attained, helping to eliminate the stress on the digestive process, improve digestion and absorption of nutrients. 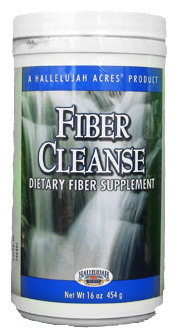 Fiber Cleanse contains 28 herbs in a psyllium and flax seed base to help you cleanse the colon, restore optimal bowel function, and ensure timely elimination of toxins from the body - a must for achieving optimal health. Use for up to 2 - 3 months to cleanse your colon. Probiotic is most beneficial to those who are susceptible to infections, disorders involving diarrhea, those who are taking antibiotics, pregnant and nursing mothers and people who are receiving radiation treatments of the pelvis or abdomen. 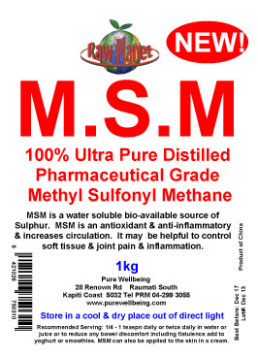 We are very happy to supply new ultra-purified distilled Pharmaceutical Grade MSM at the best prices in NZ! 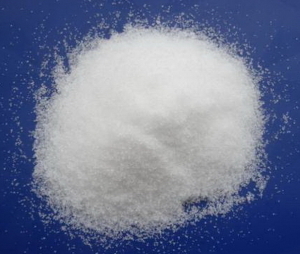 MSM - an odourless, white crystalline molecule - is a natural form of organic sulfur found in all living organisms, and is present in low concentrations in our body fluids and in the connective tissues of the skin, nails, and hair. This sulfur is necessary for collagen synthesis. MSM is a natural component of many fresh fruits, vegetables, seafood and meat, and is also found in tea, coffee, chocolate and milk. In fact, one of the richest sources of MSM in the diet of mammals is milk. MSM is also commonly referred to as 'Nature's Beauty Mineral'! MSM naturally scavenges free radicals, relieves allergies to foods and pollens, controls acidity in stomach and ulcers, and helps the vitamins and minerals we take in to nourish our bodies. It is an all-natural product derived from sulfonyl, an organic compound that grows naturally in plants, animals, and in soil. Its largest concentrations are found in pine trees. Unlike sulfur, MSM is completely water-soluble and non-toxic. Large concentrations have not been found to do any harm to the human body. It is estimated that the human body uses up to about 1/8 teaspoon of MSM each day. This needs to be replaced on a regular basis. Unless your diet is comprised primarily of raw foods, it is unlikely that you are receiving enough MSM for proper health management. Although MSM is found in many fresh foods, modern agricultural methods, food processing, and cooking cause its depletion. When we process our foods with heat or drying, we lose most of the MSM that is vital to our wellbeing. * Increase energy, mental calmness, and ability to concentrate. Resveratrol is a type of polyphenol that can be found naturally in a variety of sources including grapes, Japanese knotweed (giant knotweed), berries, peanuts, dark chocolate and tea. The French Paradox: Resveratrol, a compound found in red wine, first gained publicity in the early nineties when the CBS television show, 60-Minutes, investigated why people living in France, despite eating diets high in saturated fats, had lower rates of coronary heart disease than people living in the United States. The report concluded that a higher consumption of red wine may play a role in lowering coronary heart disease. Since then, research has pointed to resveratrol, a substance contained in grape skins and many other plants, as the compound with the possibility of preventing or delaying coronary heart disease, in addition to various other health benefits. Trans-Resveratrol boasts a long list of benefits including cardiovascular health, anti-inflammatory properties, the prevention of joint disease, improved athletic endurance, and the possibility of preventing and eliminating certain types of cancers. By increasing blood flow, resveratrol may protect not only the heart and arteries, but also the brain. Studies in the United Kingdom suggest that resveratrol may help prevent or reduce the risk of Alzheimer's disease. [Source: American Journal of Clinical Nutrition]. A study by the University of South Florida suggests that resveratrol may not only prevent, but might even reverse the dangerous build-up of fat in the liver caused by alcohol abuse. According to a study published in "Molecular Vision" in 2010, resveratrol may prevent the formation of cataract, and is an effective therapeutic agent in neurodgenerative diseases such as Parkinson's and multiple sclerosis. Although resveratrol does not lower cholesterol, blood pressure, blood sugar or promotes weight loss, resveratrol's blood thinning properties may protect you from these conditions, by preventing heart attacks and strokes. Pure resveratrol refers to a product that contains only pure trans-resveratrol, the beneficial substance in resveratrol. Various studies by both the Washington University School of Medicine in St. Louis, and Harvard University in Boston, have found that a calorie restriction diet (CR) improves health and slows the aging process in animals and humans due to limiting dietary intake. Previous research has confirmed that calorie restriction combined with exercise may increase maximum lifespan and protect against many chronic diseases including obesity, diabetes, cardiovascular disease and certain types of cancer. According to a Harvard University study, resveratrol has similar effects to a calorie restriction (CR) diet and may be used as a substitute to supplement a low calorie diet and exercise regimen. The implication of this is that while on a resveratrol regimen, an over weight individual, without losing weight, may be considered as a "healthy obese" person. According to the study, mice that were fed a high fat diet along with resveratrol performed better on a treadmill and lived longer than the thin mice that were fed a low calorie/low fat diet and no resveratrol. [Source: Harvard University Gazette/ Harvard medical school]. When it comes to maintaining optimal health, resveratrol may offer even better protection than taking aspirin. It is generally believed that high cholesterol is the main cause of heart disease. However, based on thousands of heart surgeries, many cardiologists believe that a large number of heart attacks are not necessarily caused by high cholesterol, but rather, they are the result of inflammation. Different foods may cause different levels of inflammation in our body, and even one "bad" meal can cause an instant heart attack. Another factor to consider is not necessarily the total cholesterol count but rather the particle size. According to a recent report by Johns Hopkins University, the new way of measuring risks of heart disease and strokes is done by NMR LipoProfile test, which measures the particle size of LDL cholesterol. Resveratrol's blood thinning and anti-inflammatory properties may prevent blood clotting and increase blood flow, both of which may decrease or even prevent heart attacks and strokes. One way to improve athletic endurance is through exercise. According to Johan Auwerx, from the Institute of Genetics, Molecular and Cell Biology in Illkirch, France, "Resveratrol boosts muscle endurance by increasing the energy-producing components within muscle cells". Auwerx says that "high-doses of trans-resveratrol are needed to trigger the pathway that gives cells more mitochondria. He goes on to say that, "at very low doses you don't activate the cell machinery to burn energy," thereby discounting the belief that, "one glass of wine might improve athletic prowess". The effects of resveratrol are so pronounced that endurance athletes may one day take it as a performance enhancer. Trans-resveratrol in sufficient dosage improves athletic performance and benefits everyone by making any physical activity much easier. For example, individuals who have difficulty walking up flights of stairs are able to do so with much less effort when they take resveratrol. 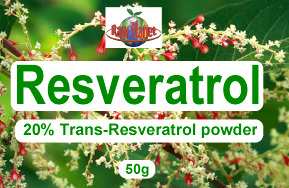 Our resveratrol is made from knotweed & is a 35:1 extract & contains 20% trans-reservatrol.